How easy is this: Put the mix in the bowl. Fill the bottom part of the egg with warm water and put it in with the mix. Beat for a few minutes. 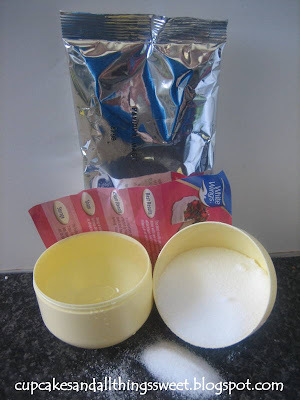 Put sugar in the top part of the egg and then pour a little at a time in the mix. That is it basically. Why didn't I try this earlier! Okay, there is one downside to this pavlova mix. It REALLY stinks! The smell does go away....after it's cooked and cooled. Oh, it takes about 1 hour in the oven to cook and then you need to let it cool in the oven so that took about 2 hours. 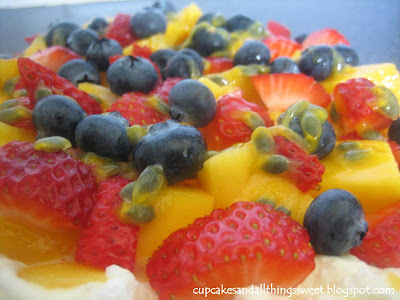 Mango, strawberries, blueberries and passionfruit. 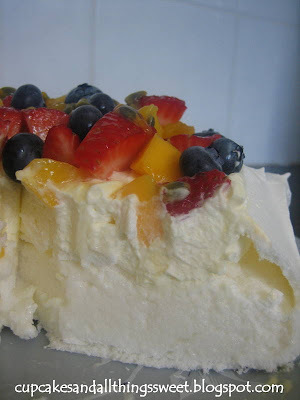 And how much cream do I put on my pavlova? A LOT! Half and half and proud of it! Sometimes I'll add a little more cream after i've got my slice. What can i say, I love cream. I'll be adding a few of these magic eggs to my food storage because I think they will be great to have on hand. These are great though for when you feel like making a cake without too much hassle :) looks nice! No matter what shortcuts you used, it looks fabulous! 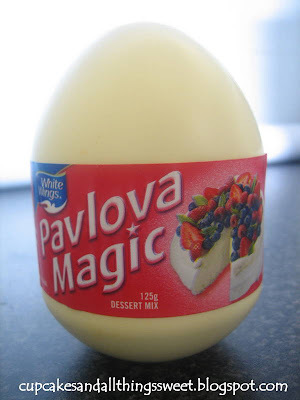 Unfortunately we don't have Pavlova Fairy here. Great post! Would love a link to it from our site. Here's how you can create inbound links from our siteCheck it out here.. This is a great way for you to build blog traffic and connect with other food lovers! Also feel free to share your recipes and tips with us!Thanks! 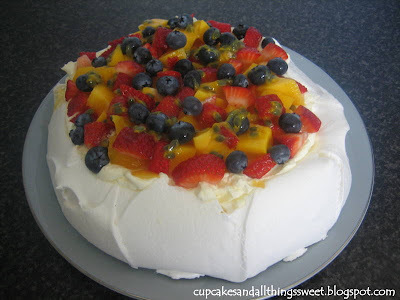 loved the pavlova magic dear, good you will now make meringue yourself again, isnt it. I moved to a new site! Check it out: www.aduckinherpond.com.